Our MSM cream has been used on animals with great success. Horse people were the first to become aware of the benefits of MSM cream for injuries, muscle and joint pain for their horses. We have testimonies from lots of horse owners. 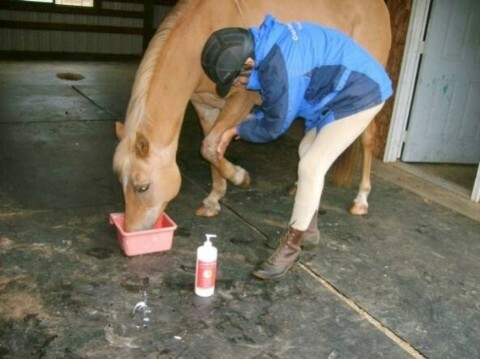 I, Grace, the formulator, have used MSM cream for my own horse, for my dogs, cats, and even for a chicken once! This is Penny, a little mare I had for several years. She had a very bad knee. She would see me coming with the MSM cream bottle (it had a red label in those days) and she would hold her knee up as if to say, "Here's where it hurts, Mom. Put it right here."